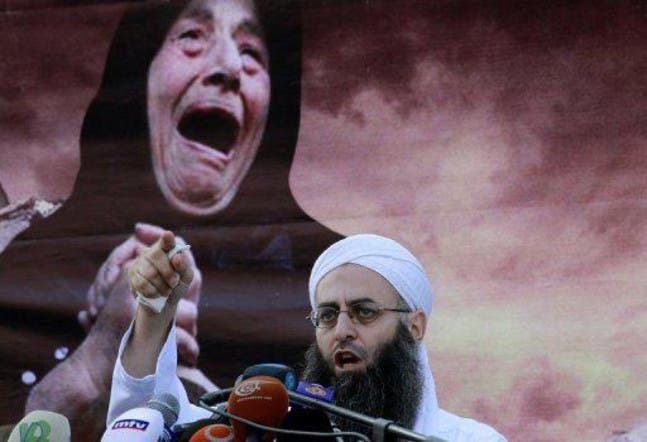 Sheikh Ahmad al-Assir, a controversial Lebanese Salafist sheikh, has urged his followers to join Syrian rebels fighting troops loyal to President Bashar al-Assad and the Lebanese Shiite movement Hezbollah. The cleric slammed the Iranian-backed Shiite group, saying its possession of weapons has hindered the Lebanese state from taking the right decisions. He told Al Arabiya that the international community is not doing anything about the two-year Syria crisis, in which – according to the U.N. – more than 70,000 people have been killed. “There is now no other choice but to defend our [Sunni] people in Syria,” Assir said. Syria’s opposition and monitoring groups have accused Iran-backed Hezbollah of sending elite fighters to battle alongside regime troops in Qusayr, an area of Syria’s central Homs province near the Lebanese border. Assir said joining the fight in Homs is “especially a duty for the Lebanese because Lebanon provides the only gateway” into central Syria. Assir has seen his following swell in the last year, in part due to his firebrand speeches and staunch opposition to Hezbollah, the Shiite Lebanese movement allied with Assad’s regime. His popularity has grown amid a crisis in traditional Sunni Lebanese political groups, and a growing sectarian backlash from the conflict in neighboring Syria. The majority of Syria's rebels, like the population, are Sunni, while Assad comes from the minority Alawite community, an offshoot of Shiite Islam. In his Monday speech, Assir also announced the establishment of “free resistance battalions” in Sidon, where he is based. “Allahu Akbar [God is greatest]! Death or humiliation!” his followers chanted. Meanwhile, in the north Lebanese city of Tripoli, a second Sunni sheikh, Salem al-Rafii, echoed Assir’s call. “We also have our people who are Lebanese Sunnis in Qusayr and Tal Kalakh,” he told Al Arabiya in response to Hezbollah’s statements that they are in Syria to defend Lebanese Shiites. “Our calls for jihad will stop once Hezbollah withdraws from Syria,” Rafii added. On Monday, Rafii called on those who wished to fight in Syria to sign up to join the fight. Lebanon has adopted an official stance of neutrality in Syria’s raging war. Until 2005, Damascus dominated Lebanon politically and militarily for nearly 30 years, though it has since continued to exert significant influence through its allies on the small Mediterranean country.